SAN DIEGO (AP) — Javy Guerra raced around the bases with one thought in mind. And even if third base coach Glenn Hoffman had held up his hands, Guerra was going to ignore them. 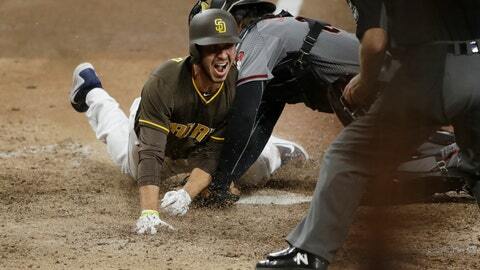 Freddy Galvis doubled home Guerra from first base with the winning run in the 15th inning Friday night to give the San Diego Padres a 3-2 victory over the Arizona Diamondbacks in a game that lasted 5 hours, 2 minutes. Hunter Renfroe’s pinch-hit homer for the Padres with two outs in the 12th tied the score at 2. Renfroe was a late scratch from the starting lineup because he was ill.
Archie Bradley gave up Renfroe’s tying drive. Guerra drew a pinch-hit walk from Matt Andriese (0-3) leading off the 15th and scored on Galvis’ double to right field. Padres rookie starter Eric Lauer allowed singles to the first two batters he faced — after limiting the Dodgers to one run over five innings in his previous outing. But the lefty tiptoed out of trouble in the first two innings. Padres: RHP Brett Kennedy (left knee) had surgery and is expected to be healthy for spring training. Diamondbacks: RHP Zack Godley (14-11, 4.75 ERA) starts the middle game of the series Saturday looking to snap a four-start losing streak. His last win came on Aug. 29 against the Giants. Godley is 3-4 with a 5.40 ERA in his career against the Padres. Padres: RHP Jacob Nix (2-4, 6.81) makes his second career start versus Arizona, with both outings coming at Petco Park. He was charged with five runs and five hits while getting only two outs when facing the Diamondbacks on Aug. 16.